Above: New Jersey native Wyatt Davis began working for the State Tourism Bureau in the late 1930s. 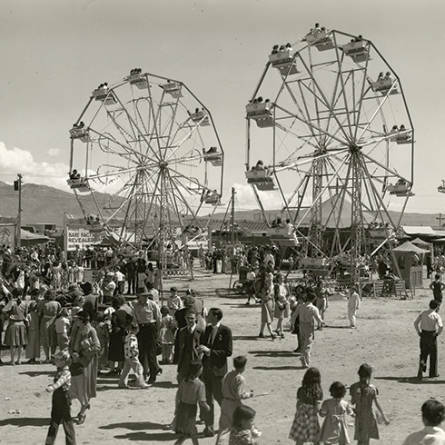 His archive includes this 1956 image of the State Fair. The New Mexico State Fair is the youngest State Fair in the Nation, but in eleven years it has grown beyond the adolescent stage and now tops many of its older brothers in other states. On what was once a barren mesa, east of Albuquerque, a Fair plant now conservatively valued at $2,000,000 has taken root. Fertilized by enthusiasm and nurtured by efficiency, the New Mexico State Fair plant has blossomed into one of the most remarkable in the nation.